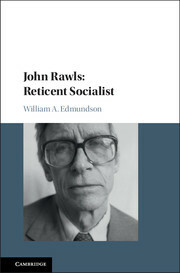 This book is the first detailed reconstruction of the late work of John Rawls, who was perhaps the most influential philosopher of the twentieth century. Rawls's 1971 treatise, A Theory of Justice, stimulated an outpouring of commentary on 'justice-as-fairness,' his conception of justice for an ideal, self-contained, modern political society. Most of that commentary took Rawls to be defending welfare-state capitalism as found in Western Europe and the United States. Far less attention has been given to Rawls's 2001 book, Justice as Fairness: A Restatement. In the Restatement, Rawls not only substantially reformulates the 'original position' argument for the two principles of justice-as-fairness but also repudiates capitalist regimes as possible embodiments. Edmundson further develops Rawls's non-ideal theory, which guides us when we find ourselves in a society that falls well short of justice. William A. Edmundson is Professor of Law and Philosophy at Georgia State University College of Law. He is the author of "An Introduction to Rights" (Cambridge University Press, 2012) and co-editor of "The Blackwell Guide to the Philosophy of Law and Legal Theory" (Blackwell, 2004). * "Property-Owning Democracy: A Short History", paper by Ben Jackson.